In Butch Cassidy and the Sundance Kid Paul Newman and Robert Redford play a pair of train robbers who spend a good part of the movie trying to evade The Pinkertons. The famous quote Newman and Redford repeat back to each other is "Who are those guys?" Answer is they were the the first private police force in the United States and they were contracted to police the railroad. The Pinkerton National Detective Agency as it was called went on to become the largest private law enforcement agency in the world, and today is part of Securitas AB of Sweden, the world's largest security company. "Who are are those guys?" Up until then Butch Cassidy and Sundance had profited off the ineptness of government police. So when they encountered these guys they had never experienced anything like it and so that was the end of their train robbing careers. "Those guys" had also stopped the Baltimore Plot, an assassination attempt on Abe Lincoln enroute to his presidential inauguration. Lincoln even hired Pinkerton and company as his private security all through the Civil War and through the end of slavery! 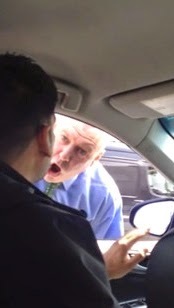 A few days ago I watched this friendly face of the NYC Police State, Detective Patrick Cherry explode on video at an Uber driver. Ironically Detective Cherry is also a member of the Join Terrorism Task Force just like the Railroad Police, our first private police force. Seeing Detective Cherry on the verge of having a heart attack reminded me of back in New York when I owned a chauffeur service. On several occasions I had NYC police explode at me worse than Officer Friendly here. Once I was also lucky enough to get it on video, which eventually led to the false arrest being dismissed. There was however no accountability nor compensation for getting falsely arrested and physically assaulted. Any realistic person wouldn't expect justice or accountability here for police misconduct. Even in the case of a successful lawsuit against the police; it's just as the saying goes "stealing from Peter to pay Paul", as the money I'd get would just come from our own taxes. That's the 1st of 5 Benefits to Privatizing Police. Private Police means private business. It's basic logic that no company in the private sector wants to lose money or risk going out of business. With a private company the individuals and the company itself are financially and criminally liable for wrong doing. For years Government police have been legally enabled to practice robbery (enough to make Butch Cassidy and Sundance jealous) as explained in this article, detailing the appalling practice known as civil asset forfeiture. Private sector police aren't afforded the same conditions, and even if they were there would be legal recourse. It's also basic logic that no individual wants to risk imprisonment. The US Supreme Court Decision of Castle Rock v. Gonzales established precedent that police have no legal obligation to “protect and serve” the population. Meaning for example, they cannot be held criminally accountable or sued for failing to respond to calls for help. Private police also don't have the Police Union to hide behind, nor qualified immunity within the government. With the free market comes competition and with competition comes lower prices. That's basic economics. Think of Government police as a monopoly; one that can never go bankrupt, fueled by the supply of our own tax dollars. In Reminderville, Ohio, the town hired a private security company for exactly half the cost of the county police contract they had been paying. The firm was able to increase the number of patrol cars in the area and improved the emergency response time from 45 minutes previously to 6 minutes. Citing the most recent example this year (2015) in a district of Houston, Texas (Sharpstown) where a community declined to renew its contract (for supplementary police assistance) with the constable’s office. They instead hired S.E.A.L. Security Solutions at a lower cost to patrol their streets; crime was reduced by 61% in less than 2 years. No bureaucratic framework and regulations, along with private sector innovation has led historically to increased efficiency in response times as shown in the two previous examples. On a cost basis these improvements in efficiency are multiplied. Furthermore the societal benefits of lower reported crimes, increased response time, and legal responsibility create a positive trickle-down effect over-all. OK, I'm not implying that we should immediately fire our entire public police force to replace them with the private sector (although even replacing Detective Cherry with a maraschino cherry could be a better option). However it wouldn't be difficult to privatize a large portion of police duties, starting with the police being paid unreasonable wages to work at construction sites and in general traffic positions. According to the Bureau of Labor Statistics, private security firms in the U.S. today already employ more security guards, patrol personnel and detectives than the U.S. federal, state and local governments combined, fulfilling many basic duties. Actually the same goes for Canada and Britain. In Virginia there are 1.1 million private security, compared to 640,000 public officers. Virginia state law allows for citizens to form their own police forces, with the authority to make arrests, carry firearms, and badges. They're called SCOPS, or Special Conservators Of The Peace, and there are now about 750 of them in Virginia, including this guy who runs his own 1 person private police department in Manassas (yes, it's really true). In North and South Carolina, all Security Officers have the authority and power to make an arrest just as Sheriff Deputies. Similar power exists in Virginia. The state has no ownership on the right to enforce the law, it only administers this right on behalf of the people. In principle there is no reason why private individuals should not have law enforcement duties delegated to them so long as they are responsible to the same system of law as the government. Finally it's important to understand that similar to how the free market checks itself, public peace is not kept primarily by the police, but by the people themselves.